Thanks for helping save me from missing out on something pretty special, having done it now I can vouch for the fact that your pictures give a very accurate account of what to expect up there. 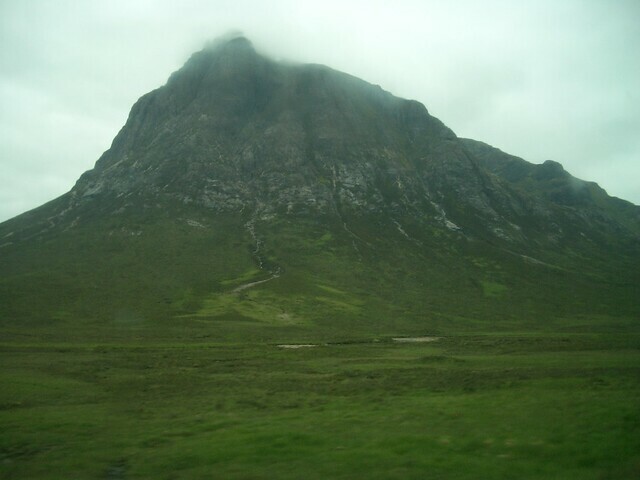 Two hours later, we were parking up beneath the mighty Buachaille Etive Mor. I’ve driven through here many times, marvelling at the hill from the road in all weathers, but had yet to set foot on it...until now. The rain had fallen steadily all the way up but subsided as we pulled into the parking area near the bothy / lodge by Altnafeadh. Although wet on the way up the road, the rain stopped and stayed off all day thankfully, easing some of my concerns about its effect on the rock, but the summit was shrouded in clag and although it would lift a little, it never fully cleared the summit. The air was pretty cool as well and we were dressed more for March than June. ...and on to the start of the North Buttress ascent, the start marked by two large boulders precariously perched on a ledge above. On reaching this we crossed the small waterfall, gained a few more feet and then stopped to don helmet and harness. There were six of us, we split into two groups of three with those who know what they were doing front and rear, newbies (i.e. those who haven't a clue) in the middle. 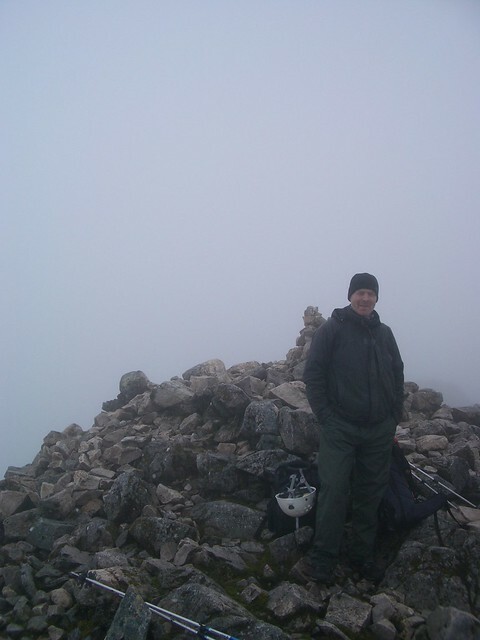 I’m not that superstitious but, it’s fair to say, the fact this would be my 13th Munro (by chance rather than design) had entered my mind once or twice in the couple of weeks since completing 11 (Glas Maol) and 12 (Creag Leacach). For the next couple of hours, I was concentrating hard on my role in this three-way which took my mind off the exposure but, there was plenty time to take this in while waiting for the others to make their moves ahead. The feeling of responsibility is acute and, while concentration plays a big part, I was really enjoying myself, emerging from many of the sections, especially the chimney sections, with a huge grin and hyperbole-a-go-go. At one point we found ourselves slightly off track and had to traverse briefly to reach the chimney sections. Allied to the fact it was a little more damp in parts here leading to the odd slip, this was probably the most exposed I’d felt thus far. Such was the intensity, I lost a couple of hours on the way up, my watch beeped and I glanced at it expecting it to read 12pm…it was 2pm. This also explained why I was ravenous and we still had a bit to go. We stopped shortly after this to re-fuel, it was possible to make out the silhouette of Crowberry Tower through the clag from here. It was a brief stop as we were in the clag now and didn’t want to cool down too much. We only had about 150m to go and the scrambling became more “slabby” , which was interesting enough and probably moreso had the clag not been down. Before long, after clambering over another slabby section and walking a short way, we were up, over and, all of a sudden, at the summit...all too soon, it was just before 3pm so it had taken approximately 4.5hrs from the van. We took ten minutes to sort-out the gear, remove the harnesses, keeping the helmets on for the time-being and then set off for the descent via Coire Tulaich, passing the second cairn on the summit of Stob Dearg on route. Stob na Doire looked very inviting but we were out of time and I’m not too disappointed, I’m confident of being back. A wonderful day, never saw anyone else on the hill all day, and I’d do it all again in a minute…hopefully in clearer conditions. 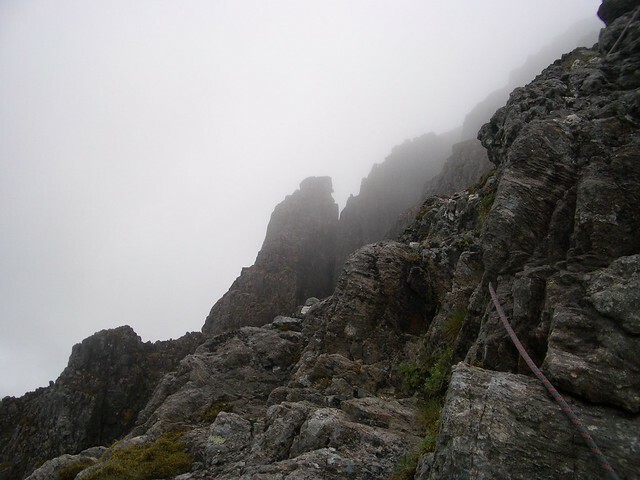 So, having expelled a few doubts with this one, it’s on to the AE Ridge in August (would have done the Pinnacle Ridge in Ardgour in July too, had I not been elsewhere, so it shall have to wait). Still feeling pretty elated after that. Last edited by BoyVertiginous on Thu Jan 08, 2015 5:59 pm, edited 1 time in total. Enjoyed that read and the way up! Do you think any bits could have been done free climbing without a rope? Mountainlove wrote: Enjoyed that read and the way up! Do you think any bits could have been done free climbing without a rope? It's all free climbing. The rope is for fall protection which you may or may not feel you need. 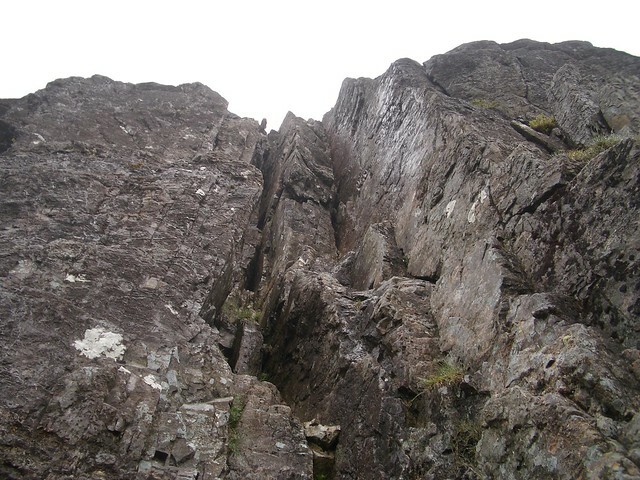 Its all to do with your own experience, confidence and head on steep scrambling. I hadn't been up it and didn't know what the terrain was like. 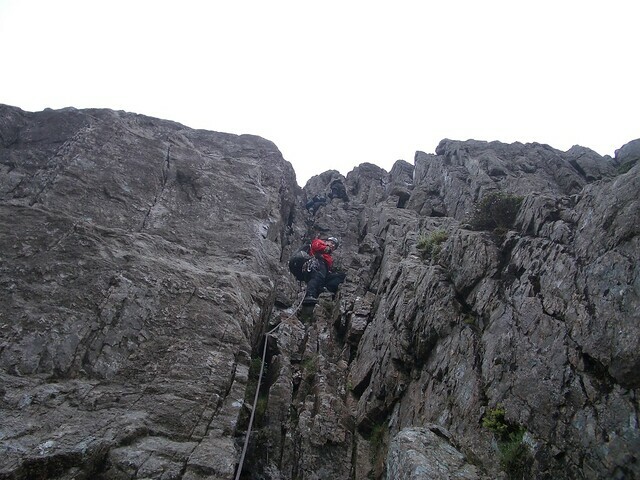 We pitched the start and one of the upper chimneys but we pretty much moved together though using running protection. We were putting in alpine rope practice for a trip to the alps which then fell through due to weather. The crux is officially a rock climbing grade of Mod but on the day I rated it as a Diff as do many others. I am glad you found the pictures useful. I should probably write a report to go along with it to aid anyone else who reads it. I also went off route and found myself in a horrible crumbly much steeper than grade 3 scrambling territority in only big mountain boots and a cut down gear rack. One point seen me at a horrible drop right down Slime Wall and great gully. I had to reverse and down climb a horrible bit with no protection to get back to the chimney proper. 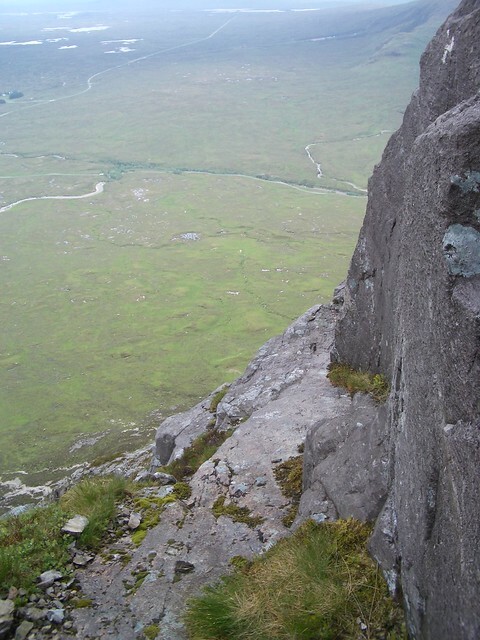 I remember a horrible slab up on the easier higher ground as well i had to traverse left on. Nicely done BV that was a pretty good achievement for you. Thanks, ML. I'm not really qualified to say, I'd heed what Milesy says above. Cheers, pidge. I'll be honest, it felt great. Yep, that was the point at which we'd gone slightly wrong and came around that ledge clinging to the "wall" to get back on route. You would not want to be without a rope if you find yourself round there. Gable Gable End wrote: Cracker!! Pitched only once, Milesy (upper chimney) otherwise running protection with occasional short bursts without. 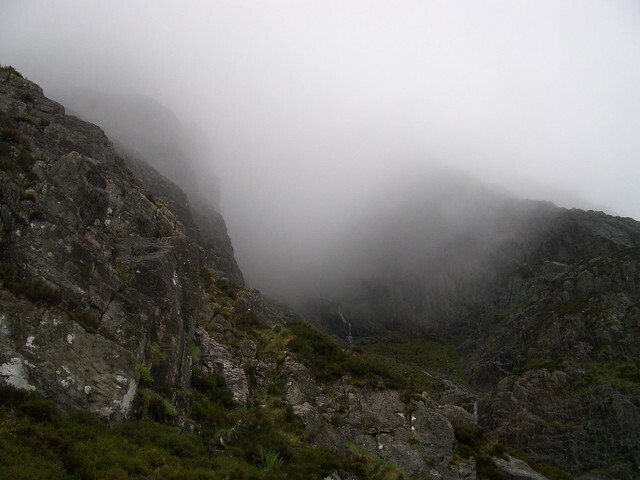 The photos told a story for me but, I didn't have to worry about route finding, an accompanying report would no doubt be useful to anyone hoping to avoid straying off route (then again, there is always the book "Scrambles in Lochaber"). Some of those slabs higher up had me throwing my legs around in ways I didn't know were still possible. I'm just about over a torn adductor and it was a good test, three months ago I'd have had to crawl over the slabs. mrssanta wrote: Nicely done BV that was a pretty good achievement for you. You know what MrsS? You're right. 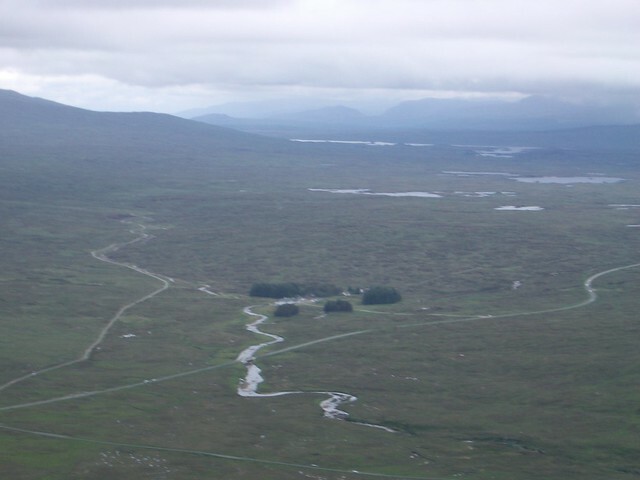 Reading about your Skye experiences recently had me reeling and thinking that I'd never manage the Inn Pinn or some of the others, now I'm not so sure. Never used to have a problem with heights, it just crept up on me a bit in recent years. Brilliant BV. Balls of steel, Mate. I have a bit of catching up to do, but your successes shall inspire me!! Really enjoyed this report. Doing without the rope? I did it solo in the 1990's and remember thinking it would be very sore if I let go....so I didn't let go! It is seriously steep and exposed but (in the dry at least) at no time do you feel your holds are insecure. In winter condition, though, it's a serious Grade IV, up there with Tower Ridge. This time, I was very glad to be 2nd on the rope! Avocetboy wrote: Brilliant BV. Balls of steel, Mate. I have a bit of catching up to do, but your successes shall inspire me!! Thanks, AB. We'll inspire each other and maybe even get out there at the same time at some point, eh?! This is good coming from you, Rockhopper. 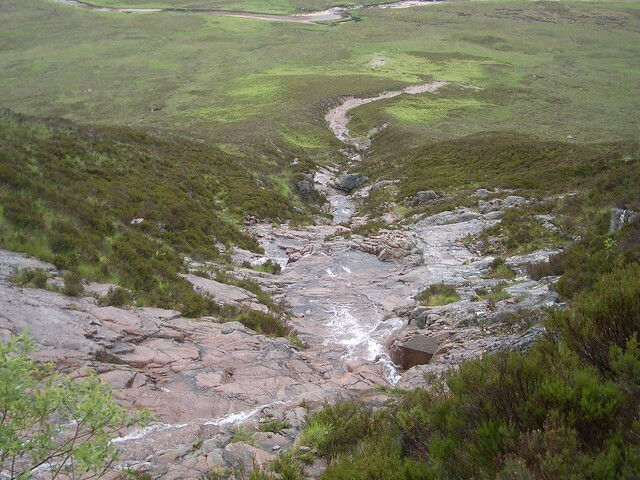 Compared to your 18-hr, 41km, 10-Munro epic in foul weather this would be a stroll...albeit a vertical one! Colin1951 wrote: Really enjoyed this report. Doing without the rope? I did it solo in the 1990's and remember thinking it would be very sore if I let go....so I didn't let go! It is seriously steep and exposed but (in the dry at least) at no time do you feel your holds are insecure. Fair play to you, Colin. There were times up there, when the adrenaline was pumping that I though it would be possible to do it ropeless, and I'm sure it is, but I also felt like I could fly! It's maybe got a bit crumblier / flakier since the 90's. True, most holds were firm (where there were any ) but it was often loose underfoot and there was a fair bit of debris falling from the guys scrambling ahead of me...I learned early on not to look up when you hear the shout "BELOW"! If doing it ropeless, then I suppose it wouldn't really matter whether you're doing it solo or accompanied, maybe for a bit of support / encouragement...and to phone the emergency services if it goes awry . I'm just not in a position to try it, nor to recommend it to others and will leave that debate to you experts. Thanks all for reading and for your kind feedback. Not alot to add except WOW- you really helped me understand the ascent with the pictures and the reality that with someone expereicne leading I would be up for trying this. Great report - edge of seat stuff... on next years list once the wife and I get our height heads in gear.. Stuc a'Chroin (my latest one) seems distinctly horizontal compared to this.! I now have a specific goal for next year !